Sick of fruit flies already? 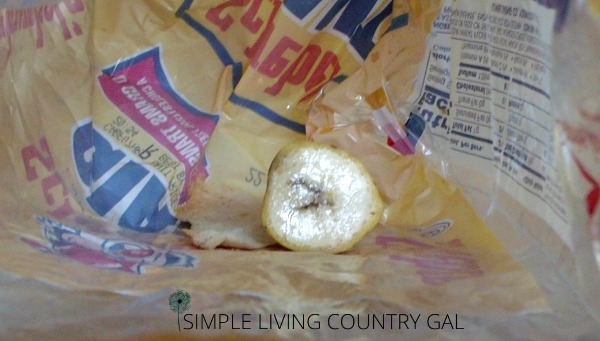 Well, this article will help you get rid of those pesky fruit flies without chemical sprays! It’s summer. I love summer. Swimming, shorts, the sunshine, fresh fruit and veggies, ice cream cones, lazy days on my swing. Ahhhh. Summer is here..at last! What I don’t like about summer is all those pesky bugs. I also don’t like pesticides. AT ALL. So if I can eliminate any small annoying creatures naturally, I will do it. Unfortunately, sometimes in order to do things naturally, you risk the loss of effectiveness. Luckily in the case of fruit flies, this is not true. I have an easy and very effective way to eliminate those pesky flies without any sprays or chemicals. The best part is you should have all you need in your kitchen right now, so it is perfect for a tight budget! 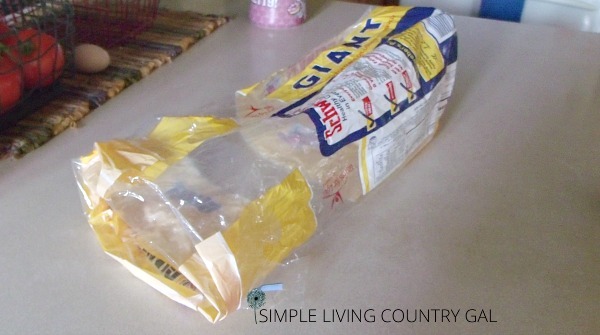 All you need is an empty bread bag and a ripe banana and you have the makings of a fruit fly trap! 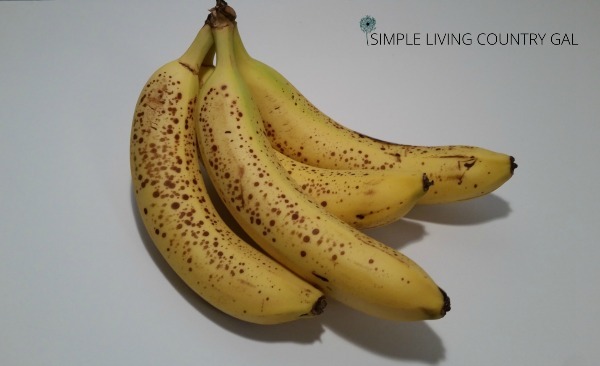 Fruit flies are attracted to sugars and bananas are the perfect way to attract a lot of flies in one shot. Take a small piece of ripe banana (larger if you have quite a few flies). Place the banana into a bread bag all the way in the back, sometimes smashing it up a bit will help as well. Bread bags work best since they are long and skinny. I have not had the same success with other sized bags. The trick here is to lure the fruit flies in and make it as difficult as possible for them to get out. That is why the long bread bag works so well. Set it in the area where you notice the most flies. I usually do this in the evening before going to bed. You may need to fiddle with the bag a bit to make sure it is going to stay open. I find if you just fold the end of the open a bit you can keep the bag open easier. No worries though, even if you have only a small opening the scent of the banana will get those flies in there. Once you get the bag opened, set up in a high traffic location and loaded with a piece or two of ripe banana simply let it sit overnight. 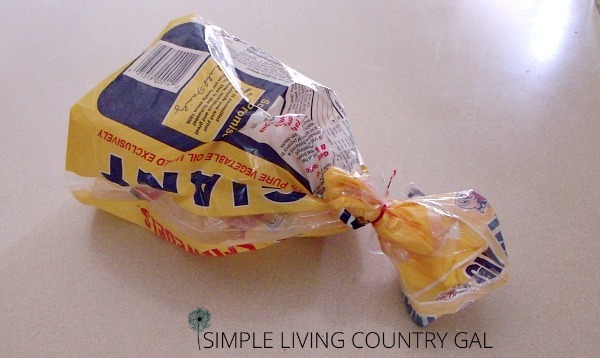 In the morning carefully close the end of the bag and twist it tight and tie into a knot. Do not move the bag at all before closing it up. Those little flies are quick and you want to catch just as many as you can. Also, do not let the air out or you will risk those pesky fruit flies escaping. Next just toss that bag in the trash. If you have a bad problem with fruit flies you may have to repeat once or twice. I have never EVER had this not work. My son had a severe problem in his home after being away a few days and not running the garbage disposal. We used this technique and after just three days every single fruit fly was gone. Remember if you are repeating this tip make sure to use a brand new bag and banana piece each time. 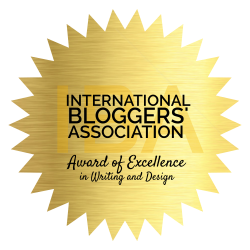 Update: Since I have done this post I have received lots of emails with alternative methods. Apple cider vinegar, dish soap, apple pieces, and other ideas. I decided to give a few of these tips a try and I have found that none of them work quite as well as the banana bag trick. If you find your way works better then great! 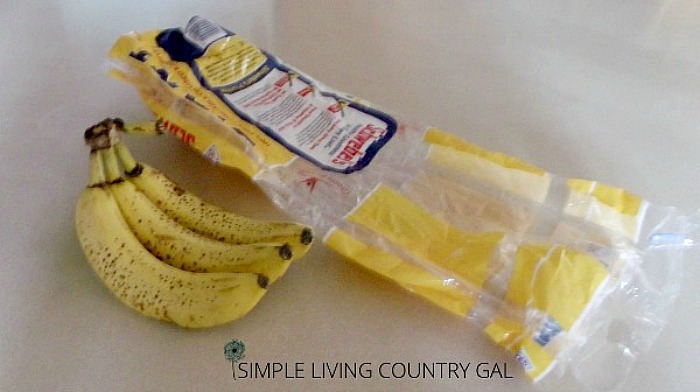 For us, however, nothing works quite as effective than the banana and long skinny bread bag to eliminate completely those pesky fruit flies. Sometimes it’s the simplest ideas that work the best. And isn’t that good news for us! No more poisons or other chemicals which can be worrying especially if you have pets or young children. If you can find a natural way to eliminate those bugs then by all means…do it! I recently discovered that leaving a bottle of witch hazel open traps them as well. They fly into the hole in the lid and get trapped and drown in the Witch hazel. Just throw the bottle away!! That is a great idea, I can’t wait to try it out! Thanks! A small glass about half full of apple cider vinegar with plastic wrap on top poked with holes the size of an ice pick sits in my window during fruit fly season! Fruit flys gone, when they come, and they will if you eat fruit! Works every year! I am really excited to try this one out as well! I use ACV on my farm with my goats and chickens (and myself too 🙂 ) so I always have a bottle in my kitchen. Which is great news since I don’t always have ripe bananas. I also love that I can keep it our for longer than just overnight. I will try this out and do an update here. You can also use vinegar. Works great! Cover with plastic wrap and put a rubber brand over it to prevent any gaps. Poke a couple tiny holes in the wrap and set the bowl near your fresh fruit. I have yet to try this tip Bre! I will have to check it out for sure, thanks! Vinegar and a drop of dishsoap. No need for any covering. The soap breaks the surface tension and they drown. I have found that you don’t even need the plastic if you put a drop or two of dish soap (ANY brand, even homemade will do). I have done this for years, as every year when I buy fruit or my daughter comes and puts it in the trash instead of the compost container. This has NEVER failed me. I find vinegar is much less expensive than wasting a banana (often pricey, and not something I keep all the time) or finding the bag has a small or large hole in it at the last minute. the vinegar will KILL them. I put it where I see them hovering the most. Several small bowls (I use glass or ceramic custard or ramekins). When full or the vinegar has evaporated, simply rinse and re-fill . I had an infestation for a LONG time, but this worked and I am now ff free ! YAY! I hate the pesky fruit flies in my kitchen. I will have to give this a try! Thanks for the great tip! I hope it works for you as good as it does for me Brooke, good luck! Try running a fan in the room. Fruit flea dry out quickly. You may need to close the doors to the room. This is a great backup for when I do not have any bananas lying around, thanks Denise! what do they look like? are they tiny? Yes LoriRose, they are really tiny! We eat a lot of fruit, bananas especially. Usually if I have fruit flies the bananas are the culprits. 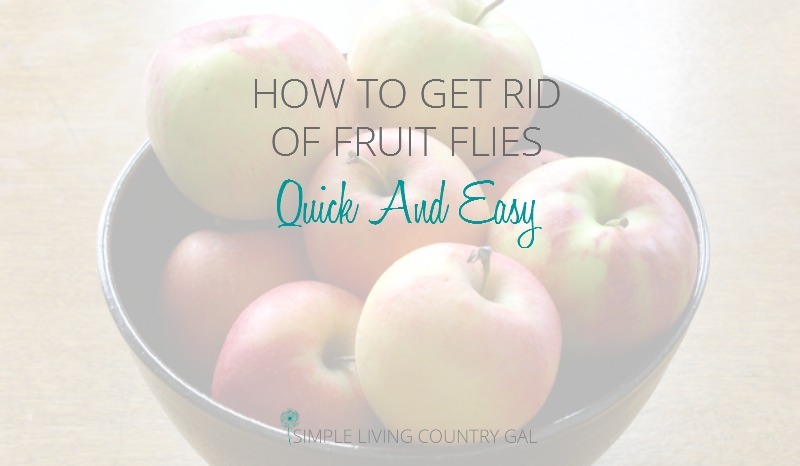 I found something that works great for us – no more fruit flies! As soon as I get bunches of bananas home, using my sink sprayer, I carefully spray all the surfaces of the peels then set the bunches out to dry. I can only assume there are tiny eggs on the peels or something, I mean, where do fruit flies come from anyways? Even in the winter (I live in Michigan) I sometimes get them. Of course I don’t do this with fruits or vegetables with delicate skins leaving me to only wash those just before eating or using. I’ve used the other traps before and they do work, but I like the sound of of the bread bag trap. Thanks for all great tips. I love to see more tricks please. I am glad you enjoy them, I will keep them coming!